With such focus on the beef industry of late, Agriland has looked at the figures available around exports and found that the value of our beef exports differ significantly between the CSO and Bord Bia. We found that Bord Bia’s calculations, around how much beef we exported last year, are estimated through their own calculations. This estimate, for 2013, put the value of Irish beef exports at €2.09 billion – a record for Irish beef exports. However, using the same product codes as used by Bord Bia in its calculations, the official CSO figures put a value of €1.73 billion on beef exports, a €364 million difference to the Bord Bia figure. And this discrepancy between the two sets of figures has been growing since 2009. The discrepancy arises over the value being place on Irish beef exports to the UK and what Bord Bia describes as an ‘underestimation’ by the CSO. 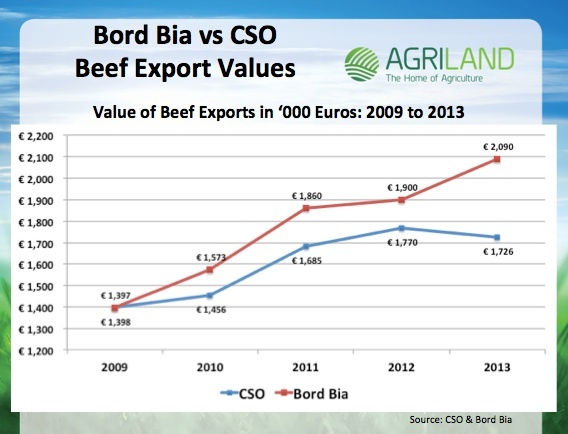 Back in 2009, the CSO export values for Irish beef, and those of Bord Bia, were closely matched at just less than €1,400 million, with just €1 million separating the two sets of export value figures. However, according to Bord Bia, Irish exports increased by 10% in value and 4% in volume from 2012 to 2013. But, according to the CSO figures, Irish beef exports actually declined in value by 2.4% from €1.77 billion in 2012 to €1.73 billion in 2013. Furthermore, according to Bord Bia, the value of Irish beef exports in 2013 was a record €2.09 billion, which was a jump from €1.9 billion in 2012 and €1.86 billion in 2011. Bord Bia calculates its value for beef exports by multiplying the average prime cattle price for 2013 of €4.12/kg (excl. VAT) by 470,000 tonnes. This 470,000 tonnes figure is what Bord Bia estimates was exported in 2013. However, utilising the same product codes used by Bord Bia in its calculations, the official CSO figures put a value of €1.73 billion on beef exports, a €364 million difference to the Bord Bia figure. The difference is equivalent to nearly €240 per slaughtered animal, or 90c/kg deadweight. However, according to the CSO, the values of Irish beef exports are calculated using data correlated and supplied by the Revenue Commissioners, and, Customs and Exise. The difference between the CSO figures and Bord Bia estimates amount to 35,000 tonnes of meat, or an 8% discrepancy in terms of weight. The CSO figures are corroborated by comparing both Irish Exports and British imports using official EU Comext figures. In 2010, Bord Bia posted values of €1,573 million, while CSO values showed €1,456, a difference of €117 million. In 2011, this difference had grown to €175 million, with Bord Bia and CSO showing values of €1,860 million and €1,685 respectively. In 2012, there was a gap of €130 million between the value Bord Bia put on beef exports (€1,900 million) and the corresponding CSO values of €1,770 million.